Well, I think that just about sums it up. In addition to that summary of the beer and the brand, I could spend the next 1500 words also talking about how mind-blowingly cynical the marketing of these beers is, but it just makes me depressed thinking about it. So, while you decide whether you are going to reward Coles’ contempt for you with your heard-earned money, I am going to curl up in a ball under my desk and quietly weep for the future of beer in Australia knowing that this company controls a quarter of the liquor market in Australia. UPDATE: There is a fuller overview of Steamrail Brewing Company and Australian Beer Connoisseurs here. Contempt is right Matt… Are Australian beer drinkers really this stupid? Perhaps they should’ve bought a historic Brew Pub and pretended the beers were being brewed there too… FAUX CRAFT should FAUK OFF!! Ha! I’m sure they considered that Anthony. The beers are all terrible but may just prove to be of some worth as gateway beers to help people make the move away from CUB/Tooheys/XXXX. Before you crawl up under your desk and weep Matt, perhaps you should try the beer? Just an idea! The alarm bells rang when I seen this beer on the shelves but I did buy 1 single bottle of the ‘Pale Ale’…….so glad I didn’t buy more…….forget under the desk, run for the hills. agree .. tried the pale ale .. big mistake .. tasteless swill … though expected nothing more from our friends at the Evil empire … Please Coles just stick to screwing over farmers and leave the craft beer industry alone …. My local first choice had a ‘One case per variety per customer’ rule on the first day the stock was on the floor. Demand must be through the roof! They’ve posted those notices quite a bit. Surprised people are not rioting in the streets! Reminds me of a book called Jennifer Government where a shoe company organises to shoot people wearing their new brand to give them street cred and drive demand… Coles haven’t quite reached that level of cynicism. “Yeah.” Hack hoped he sounded confident. He didn’t really understand marketing. 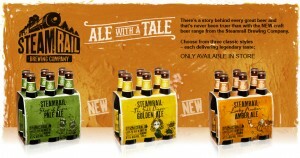 Are these beers any less of being craft simply because Coles happens to own them. Matilda Bay, James Squire, Little Creatures and White Rabbit (just the mention a few) would be in the same category. I believe Steamrail is contract brewed at the same place that Mountain Goat does their beer, so that would make just as much craft as ‘The Goat’. Mountain Goat are open about where their beers are made, I have spend 5 days, a dozen phone calls and and emails and I still can’t get a reply from Coles or their gormless PR agency. Mountain Goat’s Steam Ale is a vaguely original style and a very origial branding proposition, Coles’ is a direct rip-off of James Squires’ styles and branding. Mountain Goat has spent 15 years developing the beer market and growing Australian beer palates, Coles are coming in and reaping from a market into which they have sown nothing. Have a look at Coles’ supermarket shelves where there is almost nothing but Coles brand products, having killed off the people who have innovated. Is that what you want for beer too? As for being Coles being opportunistic,that’s exactly what Foster’s and Lion have done for years, so now there’s a third player apparently..
Mountain Goat have worked for 15 years to turn people on to craft beer, have invested heavily in a brewery and in education to grow the market. They are open about where Steam is made and are just benefitting from what they have created over 15 years. Coles have done nothing but stepped in to harvest a market that they have done nothing to grow and have done their best to camouflage the fact to the casual consumer. With no investment in the industry and having contributed nothing to growing the market or educating the consumer they have stepped in with a cheap and deceptive product that can only result in skewing the market towards the bottom. The end result of this practice is this. If your talking about one of the original innovators of Craft beer then surely Grand Ridge out in Mirboo North would be taking that prize, after all they having been going since Adam was a boy. As for Streamrail being a ‘direct rip-off’ of James Squire, a lot of Craft Beer’s have similar characteristics when it comes to the different styles they offer, e.g Steam Ale, Golden Ale, Pale Ale, I.P.A’s and alike. And I’m pretty sure that customers, would be able to tell the difference between the brands, when it comes to the packaging, as they are vastly different. I’m getting over this Hipster beer nazi craftly overpriced crafty the little bloke can do it but the big guy can’t rubbish. I wanna hear if it’s good or bad. Simple as that. Because to be honest with you some of the craft stuff is as rubbish as the faux craft stuff. Just ridiculously dearer. And then some breweries can produce winners and losers. Same brewery not the same awesomeness. Good or bad guys. Good or bad. Wow, thanks for that…though I’m not sure where the hipster beer nazi comes in. This post has nothing to do with hipsterism or being against Coles making beer. I couldn’t care that Coles is in the ‘craft’ market, but I do care that they go out of their way to hide the fact. You can say it doesn’t matter who makes the beer, but it obviously does and Coles knows it does otherwise they wouldn’t go to such lengths to camouflage the origins of this brand. It obviously does matter otherwise they would brand it homebrand as they do with their baked beans. They don’t, because they know that people do care about the provenance of their beer and who makes it. This isn’t about hipsterism, it is about the cynicism of, having invested nothing in the innovation, growth, education and development of the current beer renaissance, they wade in and seek to harvest the hard work and investment of others in building an awareness for craft beer and are devious in the way they have gone about it. “Good or bad” You need to decide that for yourself. I have been drinking an infected stinker of a beer and had someone beside me raving about the complexity of it. Who’s right? If you need someone to tell you what is good and bad, you’re as bad as the hipsters who need someone to tell them what’s cool. Try it and decide for yourself. Don’t know if I’d call it a renaissance. I’d call it other people trying to make money or living making beer. Considering the cost of setting up a brewery and how many of the new micro breweries are looking for uni graduates to brew for them I’d say most are about money. I’ve never seen any brewery micro or not advertise for a brewer head or assistant and ask to bring a sample of various styles that they’ve brewed. Just to see how good they are. If you dig deeper into who owns half these micro breweries its usually well established wineries or millionaire hoteliers. And as for delving in. How many micro breweries have all of a sudden added pretty mainstream tasting ciders to their line ups. That’d be riding some serious coat tails there. Please don’t get me wrong. I love what’s going on in the industry. The choose is fantastic. I love reading your website and others on the industry. But really everyone’s in it to make at least a living if not some big bucks. And really everyone is following the US. Which is not a bad thing either. My apologies if I’ve offended you. No offence taken at all, just discussing the points you made. As for your reply, I’m not sure I see a problem with breweries trying to make money. Is that the point of business? Fantastic. It’s great to have this discussion. It’s good to see the breweries making money or trying to as well. I just hope we don’t see a glut like what happened with wine industry but that’s a discussion for another day. I think you are quite misinformed about what micros are looking for in a new brewer or assistant brewer. Many of the breweries ask for samples of beer they’ve brewed. I also think that larger breweries do have a place in the market as long as they use traditional methods and ingredients to produce their products. With over 25 years in the craft beer industry I can tell you that the weak and poorly crafted beer brands will not survive the long haul! I’m with you Matt, if they had nothing to hide they’d put their name to it. They could support the local industry and give some shelf space the other guys that toil away at making great beer. Or alternatively they can invent their own and keep the whole pie. These guys and Woolies own most of the market and shelf space in this country. Vote with your feet and buy good beer from an independent retailer. Might cost a few bucks more but if you’re in to real beer you’re probably used to it by now. Spotted them at Liquorland the other day. The anonymity regards brewing had me tossed so I let it pass – may have been a wise decision. I’d rather spent my hard earned on a more open brewer with a reasonable product. In Australia, the issue is significant. That is because retail is a duopoly. There are no other retail markets with quite this level of power. And retailers can control choice. Craft is barely 2% of the market in Australia. I recently read an article on one breweries blog, real microbrewery shares are possibly less than 1%. So the issue is that before a market like the Australian Craft Beer market has barely had a chance to develop, retailers are trying to restrict consumer choice by pretending to be something they are not….authentic. Retailers know Craft is a target because they can make more margin than CUB beers or Lion Beers by muddying the concept. Craft beers command 40% margins. CUB and Lion barely hit 8 %. So , despite the lower volume, any move away from big brands by creating house brand beers is a win. And let’s face it, the big guys ruined beer flavour over last 13 years , so the competition isn’t big. A lot of microbreweries also released pretty crappy contaminated product , also not helping consumers learn about quality alternatives. But this is an issue much greater than craft beer. House brands control production, employment and income. Once they control authenticity by controlling taste, by controlling choice, they control economics of production. They control jobs and income. I note that Coles branded clean skin beers and control brands like Hammer and Tongs started life as Australian Made and are now produced in Vietnam. The breweries that control these beers are owned by The Vietnam Military and typically receive their finance from the State Controlled Banks that receive loans from the World Bank which are never repaid. Labour component is tiny. The point here is that Craft Beer is always about micro brewing to generate local jobs and local freshness. Control the market in the way Coles and Woolworths are now doing, which is illegal in USA 3 tier system, the concept of Australian Craft beer has no future. It will simply be a branded margin project for retailers. Retail buyers are now on bonus schemes to drive more and more products away from real brands to control brands. In all categories. So sadly…unless there the ACCC gets serious controlling retailer behaviour and market predator behaviour, I don’t think Craft beer has much future as Craft. In Australia. There will be some stand outs but it will be one of the worlds toughest beer markets. It is today and will continue to be so simply because it is so open and so controlled by two retailers. I respect the few gutsy craft breweries that are sticking to their guns and promoting microbreweries by establishing unique quality initiatives as distinct from Craft beer brands..which in Australia, clearly have no real meaning given the behaviour of big retailers and example like Steam Rail which will increasingly emerge. But it will get harder and harder. There made at the same place that make Platinum Blonde, Broo, Mountian Goat, McLaren Vale, King Fisher and a few more in a steinecker brewery, there are quite a few people using steinecker, even the so called real craft brewers. The issue isn’t the brewing equipment, it’s how the equipment is used. I’m not sure I would hold up Platinum Blonde and Broo as being the same thing as Mountain Goat and McLaren Vale. I wasn’t holding them up as the same thing the comment was purely a comment about where they are made. Also i mention the brewery to point out it isnt the equipment but the recipe, dont get me wrong some of the trial stuff the mountain goat boys come up with makes me cry that i cant go and buy more of it. A dark IPA that i will never get to drink again is making me tear up as i type this. the MG boys do know how to make beer for sure. I have tried and like the Amber Ale , a good beer , I think that it is a champagne beer. It must be because there are never any cartons left at the outlets & you can hardly ever get it. At one stage they had beer glasses to give away with every carton and they are a good size to drink the amber ale out of. Have just gone through my first case of Steamrail pale ale which I got from Liquorland.. A very nice beer at a great price…..Best value for money in years..!